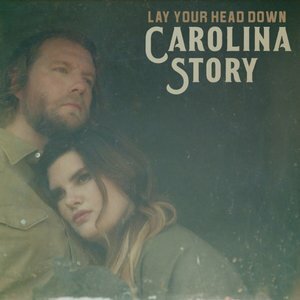 Carolina Story's intelligent lyrics coupled with soothing harmonies evoke bygone musical folk eras on Lay Your Head Down, a grounded Americana album. Ben and Emily Roberts, the married duo who makes up Carolina Story, almost quit the music scene. They took a hiatus citing a feeling of stagnation. After ten years of moderate accomplishments and accepting every gig offered to them, success was not immediate. Their frustrations began to push them towards new personal directions, but music called them back. Carolina Story have built themselves a devoted fan base of Americana enthusiasts, their roots-based music is praised by critics, and the duo have performed several times at the Grand Ole Opry. Indeed, it is gratifying to hear them return to music as their intelligent lyrics coupled with soothing harmonies evoke bygone musical folk eras. Their recent release, Lay Your Head Down, certainly gives fans a grounded Americana album. There is a resounding influence from the 1960s folk revival movement heard throughout Lay Your Head Down. In "Lay Your Head Down" and "Your Children's Children" the vocals are euphonious and mellow until the harmonica disrupts the tranquility. In the latter track, the harmonica signals a tempo shift and an instrumental crescendo. For the title track, their use of the harmonica exhibits a similar type of disquietude and melancholy as heard in Bob Dylan's "Blowin in the Wind". The harmonica's clarion and Carolina Story's wistful vocals come together to call for happiness. Typically, a harmonica symbolizes an image of an ephemeral and carefree lifestyle. This lighthearted imagery contrasts with "Lay Your Head Down's" lyrics that demonstrate the lugubrious toll life can take: "How the time flies when you're stuck in a rut / Come on baby won't you dry your eyes... Though you're hurting / Take your burdens / And put the load on me." The use of the harmonica injects a musical sense of hope: right when you think life has become too heavy energy can reinvigorate. That is representational of Carolina Story's professional and emotional sea change before recording the new album. Languor underscored by optimism is revisited in the subsequent track "Gold" as Carolina Story emphasizes self-awareness. They realize the stymied feeling is temporary as "life knocks you down / On that dirty ground / All that dust you find is really gold." This tinge of hope is reiterated by an upsurge in electric guitar that musically represents the optimism. Lay Your Head Down's focus on personal ennui is appealing but also tiresome. Especially since the theme of dejection is revisited constantly throughout the album including "My Feet Keep Moving Still" and "We Were Young Once Too". Despite the thematic repetition, the tracks share a tenderness and a longing for personal solace. "We Were Young Once Too" showcases the remembrance of youthfulness as an idealized era. The lyrics express "come back baby, let's rewind / Come back baby let's go back in time." The emphasis on sorrow, though, misses the opportunity to examine the trade-off between youth and wisdom and the track becomes overburdened with sentimentality. Throughout Lay Your Head Down, Carolina Story evokes natural imagery that melds with their emotive lyrics. In the title track, for example, they sing "Springtime came with a vengeance this year / The river rose high / The water ain't clear." While "Set in Stone" specifically mentions "I would swim the deep / Scale the mountains and valleys for you / I know it's hard to sleep through the driving rain." The emphasis on natural imagery exhibits a return to a simpler existence and a renunciation of the mass consumption constructed by capitalism. This sentiment is revisited in "Rich Man", Carolina Story's anthemic rejection of materialism. "Rich Man" is the closest Carolina Story gets to relating any type of political or social commentary. It's disappointing considering their music is so reflective of the folk revival movement of the 1960s that was ushered by political and social resistance. If there's ever been a time for another revival movement, the time is now, and Carolina Story is the group to lead the way. Perhaps antinomy isn't the point. Carolina Story's Lay Your head Down impresses to listeners their experiences as rooted in creativity and affection. Through their lyrics, they illustrate that optimism and melancholy are not mutually exclusive. Ultimately their album meaningfully documents the mental shift from self-doubt to perseverance to passion. The idea that weariness is fleeting is a necessary reminder for any listener and certainly Carolina Story's aim.